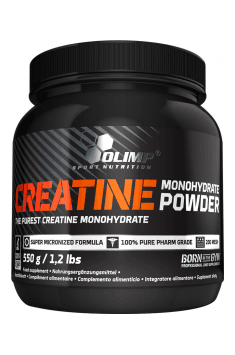 Olimp Creatine Monohydrate is a dietary supplement with pure micronised creatine monohydrate in powder form, designed for physically active individuals who want to enrich their diet with a compound promoting the development of lean muscle tissue. In addition, the formulation helps improve physical fitness, normalises energy production in the body and has cardio- and neuroprotective effects. The preparation contains only creatine monohydrate. This means that the supplement is free of unnecessary fillers which could react with this important compound, impair its absorption and cause side effects. Creatine is a compound produced in the human body by the liver and kidneys and mainly stored in the muscles. It is structurally similar to amino acids which are its components, i.e. glycine, L-arginine and methionine. Creatine can be also supplied in a diet. Its found naturally in great quantities in red meat, e.g. beef, veal and mutton. However, these foods are indigestible and their excessive consumption may cause digestive discomfort. Because of that, dietary supplements with creatine have been one of the top preparations recommended to athletes in recent years. What is more, studies show that the compound in supplement form (powder, capsules) absorbs better and is more bioavailable than creatine present in food. Creatine has a major role in improving fitness and may stimulate the growth of muscle tissue. This is because it is converted into phosphocreatine and becomes a reservoir of high-energy phosphates, needed to regenerate ATP from ADP and AMP. ATP (adenosine triphosphate) is a basic source of energy for a cell. Its depletion and slow regeneration causes tiredness and speeds up the onset of fatigue. Since ATP stores are depleted faster during intense physical activity, one of the key benefits of creatine supplementation is that it speeds up the regeneration of this compound, thereby increasing the force of muscle contraction. By boosting total cellular phosphocreatine levels, we can speed up the resynthesis of ATP from ADP. The replenishment of creatine stores leads to an increase in muscle size. Because of that, supplementation with this compound is especially important for individuals who are doing sports regularly or are professional athletes. Nonetheless, beginners will also enjoy benefits of creatine supplementation because it greatly accelerates training progress, boosting your energy and thus improving motivation. Apart from its positive impact on muscle tissue development, creatine has also cardioprotective properties. It protects the heart from energy depletion due to hypoxic stress caused by e.g. ischaemia or low oxygen supply. It provides mitochondria found in cardiomyocytes with energy, thereby enhacing myocardial contractility and stimulating recovery processes. What is more, creatine has been shown to reduce cholesterol levels. This contributes to a reduction in the risk of atherosclerosis and may consequently lower the incidence of ischaemic stroke. Furthermore, studies demonstrate that creatine promotes cognitive functions and its daily supplementation prevents neurodegenerative diseases. Since there has been a great interest in creatine in recent years, this compound has been studied by researchers from many institutes around the world. They investigated its safety prole and potential toxic effects on the body. They also examined the effects of creatine monohydrate, which is present in this formulation. Research results have shown clearly: creatine is totally safe. It does not have a toxic effect on the body and that is why you should not worry about e.g. your kidney health. Even long-term supplementation does not cause side effects. On the contrary, it was shown that creatine intake for up to 8 weeks increased the force of muscle contraction by 78%. In addition, creatine increases water retention in muscles, thereby enhancing their appearance because they are better defined. As a consequence, you can obtain better and faster results from exercise, which motivates you to work out more. To sum up, Olimp Creatine Monohydrate is a dietary supplement with a wide spectrum of action, recommended primarily to physically active individuals who want to increase training intensity and accelerate training progress. What is more, the supplement should be taken by persons who want to maintain a healthy heart and boost the brain’s cognitive functions. Take 5 grams in the morning on an empty stomach and 5 grams directly after training. Take 5 grams in the morning on an empty stomach. Using creatine is recommended to people who want to increase energy supplies and facilitate gaining muscle mass. It is recommended to use creatine according to the indications in order to avoid side effects such as the uncomfortable feeling of contraction in the stomach. One should also take care about proper liquid supply, as its deficit may lead to diarrhea and nausea. In the loading periods one should take 20 g of creatine a day, preferably 5 grams every 3-4 hours and later to maintain, a daily dose of 5-10 g. The most effective is to take 5 g before and 5 g after the training along with a protein shake.